After a mostly impressive showing last time out with High Noon and Rio Bravo, the pressure was on this week’s films. Could they stack up or even surpass the quality on show last time? First this week is 1950’s Winchester ’73 which stars Jimmy Stewart as a man named Lin. Now, I unaware that this was a first name and found it quite disconcerting, but when I realized that it was basically “Lion” without the “o” I soon relaxed into the film. There are several intertwining plots in this picture, all told as we follow a Winchester repeater rifle (called a “repeater” because it could repeatedly shoot you in the face without it having to be reloaded). Known as “the gun that won the west”, it is the film’s through line, introducing us to a whole array of different, colorful characters. Which isn’t to say once a character leaves we never seem them again. 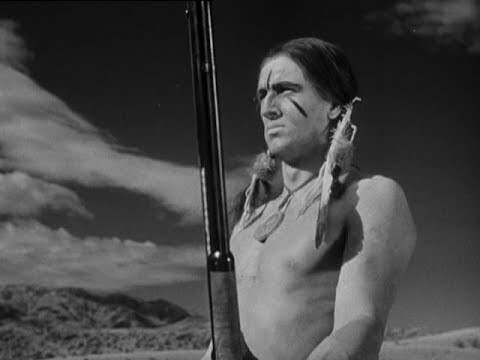 Lin has the gun at the start of the film and he has it again at the end, but only after it goes from him to outlaw ‘Dutch Henry’ Brown (later revealed to be Lin’s brother), Dutch to a trader, trader to a Native American leader (played here by Rock Hudson in a fancy dress wig), the leader to a young engaged couple, the couple to an outlaw, that outlaw back to Dutch, and then finally from Dutch back to Lin. The gun is passed around more than a joint on prom night. The wig can be cleaned with any other color, including whitewashing. At 92 minutes long the constant moving around of the gun gives the film a wicked, kinetic energy that has been absent from some of the longer, flabbier films I have watched. You want a small, western town home to a (real life) sheriff? No problem. A tense scene in a trading post between a buyer and seller? Here you go. How about a trader attempting to strike a deal with a local Native American tribe? Coming right up. And what about a brother vs brother shoot out, where one has the higher ground much like Obi-Wan did over Anakin in Star Wars Episode III: The Revenge of the Sith? Well they have that too! This movie is, in my admittedly unlearned mind, the epitome of the ‘classic’ western: guys in hats chasing and shooting at each other, on the surface fighting over something that doesn’t mean that much, but instantly makes sense when their familial history is revealed. On a more personal note I really loved the final shoot out between Lin and Dutch. A film should get the basics such as character motivation right, but when a film gets them so right, when the characters and their decisions that forced them into this situation, two brothers shooting at each other on a cliff face, it really is a joy to behold. It also dawned on me that Jimmy Stewart’s Lin is what I think of when I picture a cowboy. Earnest, well meaning and tough, he is the perfect western protagonist. 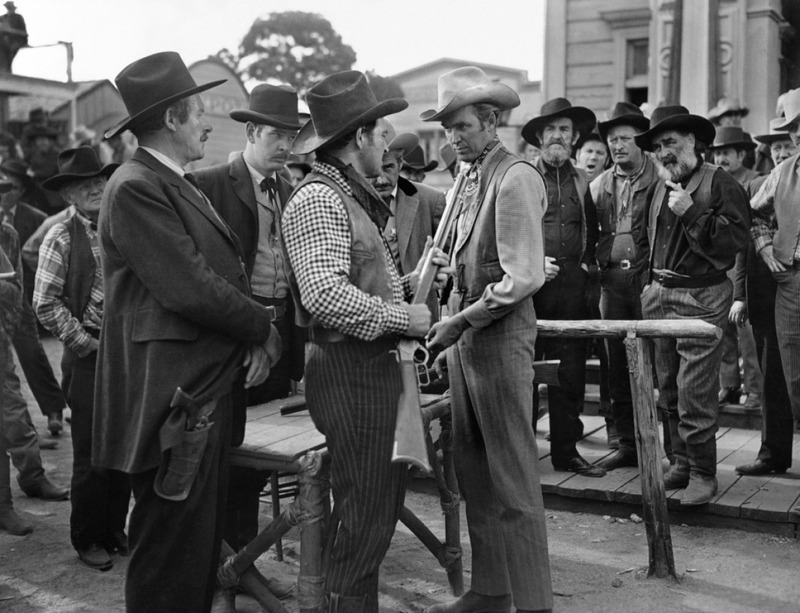 This performance as well as his turn in How the West Was Won shows how good Jimmy Stewart was. That guy was a class act. 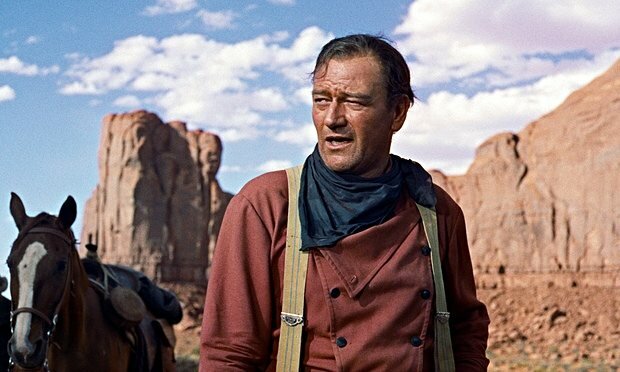 Speaking of Western archetypes and character motivation we move onto 1956′ The Searchers, Once again starring John Wayne as a man in a hat and red chef’s jacket. He works in one of them fancy restaurants. Now, even with my lack of knowledge when it comes to the western genre I still grew up loving films (I used to buy Empire magazine every single month before I moved to university, but I soon discovered that money is better well spent on keeping oneself alive rather than reading what’s happening with the Cranked series), so yes, I’d heard a lot about The Searchers. Never seen it mind you, but heard of it, yes. I heard it described as “the most influential westerns of all time” and “one of the greatest movies ever”. I was, of course, cynical going into it. So far I’ve watched two John Wayne films (not counting his glorified cameo in How the West Was Won) for these articles, and neither had really impressed me that much. But still I gave it a go. What followed was, too put it lightly, once of the best films I’ve ever seen. Beautifully shot and telling a heartbreakingly melancholic story of Ethan Edwards (Wayne) returning home to his family after serving in the Civil War. After going out with a group of men to investigate stolen cattle they realise that it was a ploy by local Comanches to draw them away from their families. Upon returning Ethan finds his young niece Debbie kidnapped and the rest of his family slaughtered. What follows is a tale of obsession as Ethan and his ever dwindling band of men embark on a years long mission to rescue his niece and exact revenge on the tribe that kidnapped her and murdered his family. There are two things that set this apart from the other westerns I’ve seen so far: the character of Ethan Edwards and the imagery. Pictured: John Wayne looking for Carl Foreman. Ethan Edwards is without doubt the best character I’ve seen John Wayne play so far. It can be argued that his insistence to carry on searching beyond the point of reason is brave, but I prefer to see it as a man obsessed, carried by his compulsion to exact revenge. He may continue to argue that he is doing this to save his niece, but it is not entirely convincing. A good pointer to this is when his group find a dead Comanche. Now, most people would probably leave the body as it is, but Ethan decides to shoot the corpse in both eyes. Ethan’s explanation of this is that the Comanches believe that you cannot enter the afterlife if you do not have your eyes, so Ethan decided to subjugate the Comanche’s soul to wandering around on earth. That to me doesn’t strike me as a “brave” man, it strikes me as a vindictive one. This is further solidified when Ethan and Martin (Debbie’s adoptive brother) find the tribe years later. Inside they find Debbie, now in adolescence and very much a part of the tribe. But Debbie doesn’t want to be rescued, she has become a comanche and wishes to stay with the tribe. After searching for five years for her, only to discover that she doesn’t need to be rescued, sends Ethan over the edge and he tries to kill her. Now, he soon changes his mind and she does actually return home, but the fact that he actually tried to kill the very person he tried to save shows that this character is still a far cry from the what John Wayne usually he plays. He is layered and enigmatic, empathetic yet vindictive. And as mentioned above the film is beautifully shot. 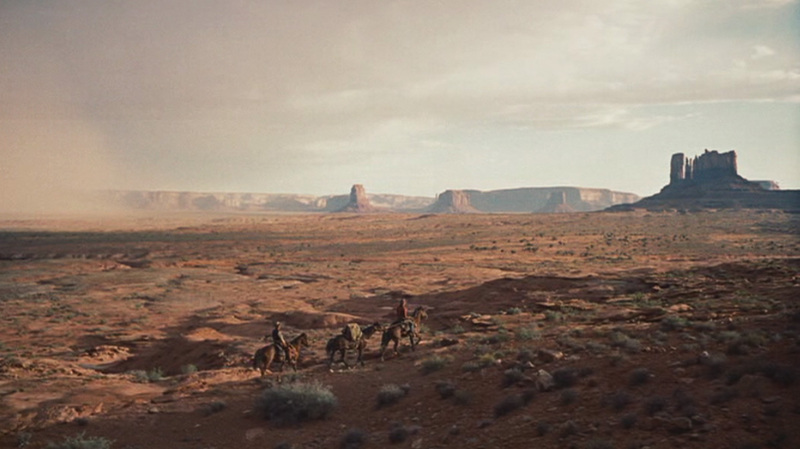 Director John Ford absolutely hits it out of the park with this one. He fills the screen with wide, barren landscapes, hammering home how alone these characters (namely Ethan) are. Yes there are one or two instances when the shift from luscious, real life places to a poorly lit exterior set is a little jarring, but I’d still recommend buying this on blu-ray, if only for the final shot. And what a final shot. Surely one of the most iconic in all of cinema, it is the most heartbreaking thing of all. 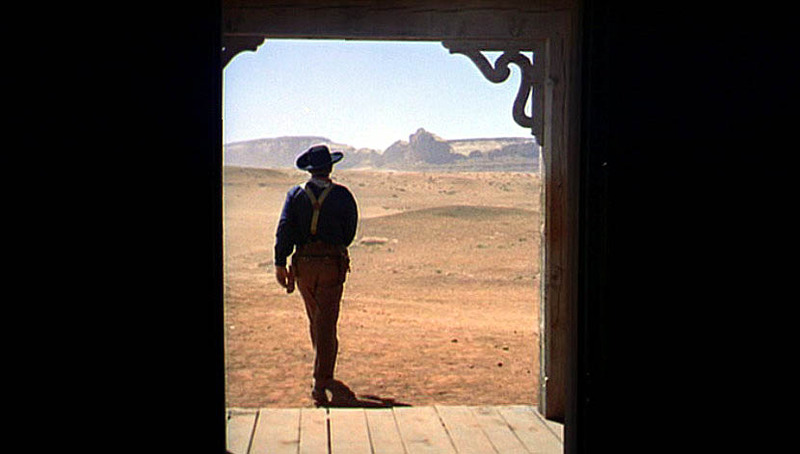 Yes, it is completely and wonderfully gorgeous, mirroring the start of the film, but look at its subject: Ethan framed perfectly in it, walking away from the house, back towards the land he’d just spent five years traversing. Realizing he’s dropped his wallet. He is a man of war, spending eight years away from his family to fight, and then another five searching for what little family he had left. In that time he has undoubtedly been surrounded by death and darkness. Him heading back toward the desert, the darkened doorway on either side of him, and then it closing shut on him, is him realising that he is meant to have a dark life. Despite finally achieving what he wanted and rescuing Debbie, he realises that he once ago has nothing in his life, nothing to spur him on, nothing to fuel his vindictiveness. If he doesn’t occupy himself with the darkness that has eclipsed the last thirteen years of his life then he has no choice but to face the fact that he is not a good or brave man, but a vengeful one. And that’s it. Two utterly wonderful pieces of work, one of which is not only one of the best westerns I’ve ever seen, but one of the best films. If I were going to rank these (which I still might once the list is finished) these two would definitely occupy the top two spaces, just beating out High Noon in third. 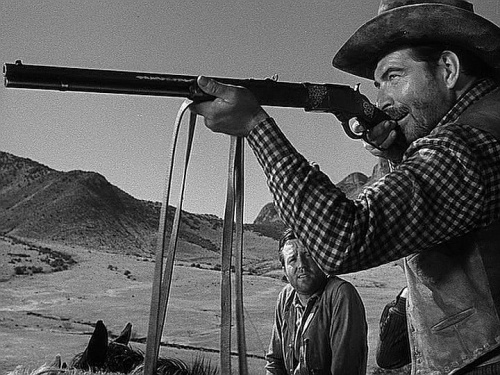 Next time it’s 1960’s The Magnificent Seven and 1962’s The Man Who Shot Liberty Valance. Now I don’t know if either of those will top what I watched this time but I have only heard good things, so here’s hoping.